Each time we see Woods (and it’s been quite a few lately) we are struck by the evolution of the band. Despite not being a particularly longstanding act (though I suppose they are by the scene’s current standards), they already feel, in a sense, like godfathers of the scene. Part of that is that comes from their status as the foundation of Woodsist Records, a label that has spawned groundbreaking acts coast to coast (the West Coast feel of many of their offerings is undeniable). But it also comes from their music itself, which evolved from the typical 3-4 minute rock format into sprawling, layered psychedelic compositions. I cannot call what they are doing “jamming”, for one because it is so anathema to the local aesthetic, and also because it feels pejorative and limiting. What Woods are doing is gradually expanding their sound and sharing their virtuosity on their instruments with us – not aimlessly noodling for a bunch of wookies. Being part of the Woodsist showcase at the 2010 Northside Festival, this performance at Music Hall of Williamsburg did not boast anything as massive as the 16-minute “Bend Beyond” we witnessed at the Abrons Arts Center performance, but it did feature a stretched out “I Was Gone,” “Blood Dries Darker,” “The Hold” and a still-respectable 9-minute “Bend Beyond.” The show was packed, and the audience was treated to another can’t miss performance that cued up another fantastic set from Real Estate to close out the night. 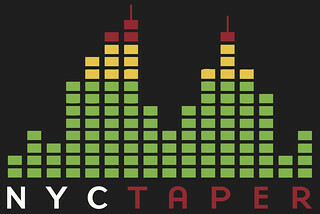 The NYCTaper team recorded this show from our usual spot at the soundboard booth using two separate recorders and a combination of six mics. The results are exceptional and even better than the Real Estate recording. Enjoy! If you email nyctaper for access to these recordings, we expect that you will PLEASE SUPPORT Woods, visit their MySpace page, and purchase their official releases, including their latest, At Echo Lake, from Woodsist Records.